Lycett prepared a number of drawings with the view to publishing them as a portfolio of lithographs. 'Views of Australia' was to appear in twelve monthly parts from 1824, each part containing two views of NSW and two of Van Diemen's Land, with descriptions and a map supplement. 'View of the heads at the entrance to Port Jackson', a view of Sydney Harbour, was one of these lithographs. 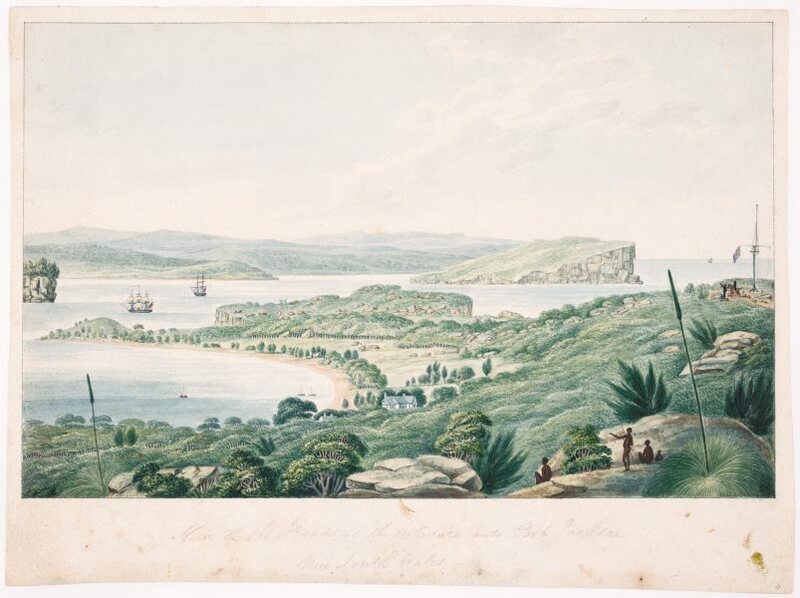 The subjects Lycett chose for his Tasmanian views corresponded with the places Governor Macquarie visited on his tour of inspection with artists George William Evans and James Taylor in 1821. It is unclear whether he visited all the sites included in his 'Views of Australia'; there are no references to his inclusion in the party in Macquarie's journal. Lycett may have copied the work of others for some of the plates; certainly he changed many of the features (such as the vegetation) to comply with contemporary English ideas on picturesque composition, and differences between extant versions seem to indicate that there was probably more than one 'original' drawing for each plate. Hendrik Kolenberg, 19th century Australian watercolours, drawing and pastels from the Gallery's collection , 'Introduction', pg. 6-16, Sydney, 2005, 9, 22, 23 (colour illus.). John McPhee, Look , 'Joseph Lycett: convict artist who captured the colony's early years', pg. 18-19, Sydney, Apr 2006, 19 (colour illus.). Australian images: Prints, drawings and watercolours from the collection , Sydney, 1979, 7.